The Bay To Bay 13's went to the 2013 Junior National Championships in Reno, NV during the week of July 1. They played well, and won their first game ever. 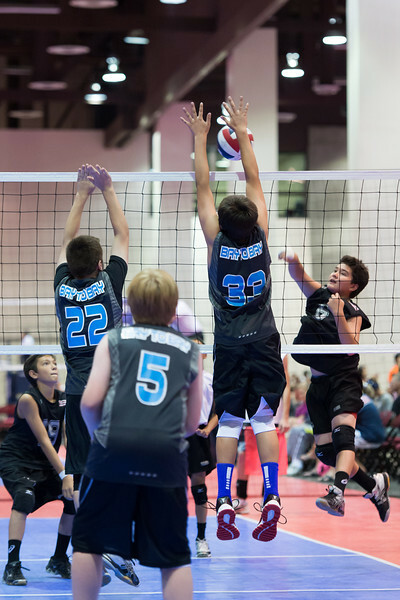 These pictures were all taken on July 3, which was day 2 of the tournament for the 13-Black team. They won their second-to-last game that day, and much celebrating followed. Note about the colors: the Reno convention center has lighting with a distinct color hue, plus the courts were all blue or red, resulting in a color balance mess. I tried to correct the colors a little, but with limited success. Please excuse the strange skin tones.